Shoving exposition into a summer blockbuster is quite a feat when it consists of years of mythology, both of the comic book kind and that of Norse folklore. 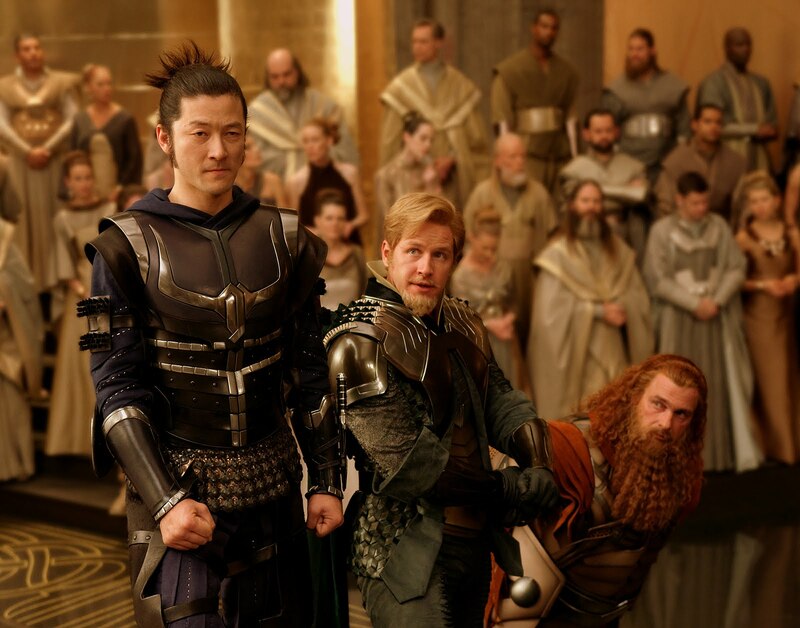 In Thor, director Kenneth Branagh not only manages to accomplish both quite expertly, he also leaves room for the larger backstory of the interwoven Marvel films. Branagh (Henry V, Hamlet, and Much Ado About Nothing) is, not too surprisingly, a great fit at the helm of the latest Marvel Comic-inspired movie. At its core, Thor is a tale built of legendary battles, palace intrigue, and sibling rivalry on a grand Shakespearean scale. Those familiar with Norse mythology will find that Thor hews pretty closely to its original source. 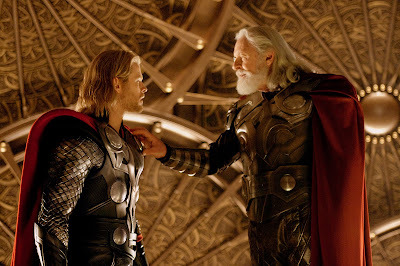 Played by Chris Hemsworth (Star Trek), Thor, son of Odin (Anthony Hopkins), is about to be named successor to the throne in Asgard, a heavenly dimension populated by the Norse deities. But a foolish expedition into Jotunheim—land of the Frost Giants—foments a war Odin has tried desperately to stave off for centuries. Odin, angered and disappointed at Thor's disregard for his kingdom's safety, strips him of his immortality and his powerful hammer Mjolnir, banishing him to the dimension of Midgard, which we know as Earth. There the exiled god of thunder meets a group of scientists, led by Jane Foster (Natalie Portman), searching the desert skies for an interdimensional bridge. Back in Asgard, the stress of his son's banishment takes its toll on Odin, and he falls into a coma, the Odinsleep, paving the way for Thor's deceptive brother Loki (Tom Hiddleston) to usurp the throne. Thor then splits into dual storylines, one in Asgard, one on Earth. Earth's plotline shows the greatest deficiencies. Set in the fictional New Mexico town of Puente Antiguo (ancient bridge in Spanish... how clever), it suffers from being saddled with the set-up for the future Avengers movie which will team up Hemsworth with Robert Downey's Iron Man and Chris Evans' Captain America (who makes his screen debut later this summer). 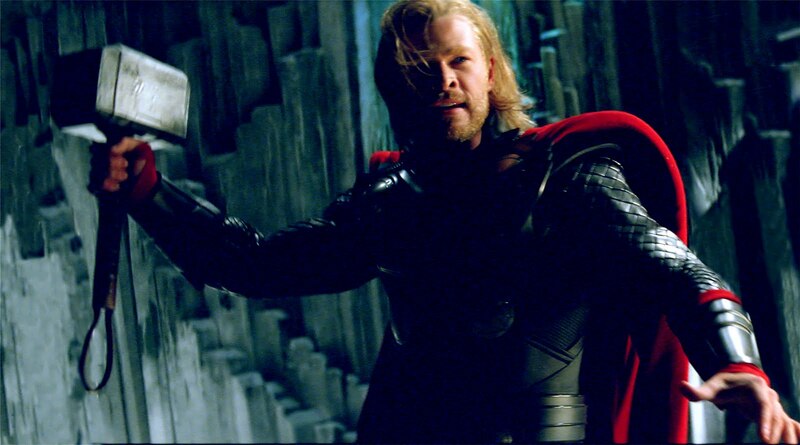 Much of the story revolves around the discovery of Mjolnir, Thor's hammer, now embedded in a rock awaiting for someone worthy to free it (a twist stolen from Arthurian legend). Ostensibly, a chance to humiliate the superhero as he claws his way back to the top of Marvel's pantheon, this story is really an excuse for Hemsworth and Portman to make lovey-dovey eyes at each other as they try to recover Mjolnir. (Continuing on the trajectory she began in Black Swan, give credit to Portman for rolling with the punches and appearing much looser here than usual.) Mjolnir's mystique also provides a reason to call in SHIELD, the superspy organization represented by Agent Colson (Clark Gregg)—or "son of Col," as Thor calls him—of the Iron Man movies. Branagh's excessive use of Dutch angles while in New Mexico is his admission that the story there is all quite dull compared to the doings in Asgard. Made of CGI golden spires bathed in warm sunlight with the wondrous rainbow Bifrost bridge extending out into other worlds, Asgard is where the fun is really at. Most of this is due to Tom Hiddleston's performance as Loki, the jealous brother who is hard to pin down as just another villain. In truth, much of his motivation stems from the fact that Thor is a battle-hungry, vainglorious twit which, guess what? He kinda is. The only ones who realy seem to get Thor are his friends, other braggarts like the boisterous Volstagg (Ray Stevenson) of the Warriors Three, and the Amazonian Sif (Jaime Alexander). 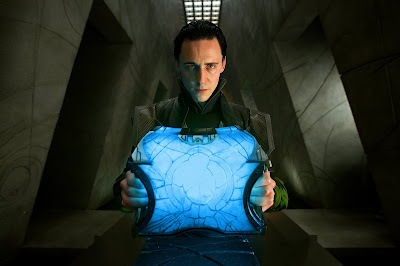 It's in large part because of out-sized characters like those that the Asgard sequences are so delightful, with Branagh reveling in the lush brilliance of it all, especially in contrast to the dark iciness of neighboring Jotunheim and its chilling Frost Giants, and one wishes the entire movie was set in this world. But alas, as a title reminds us at the end of the credits roll, "Thor will return in The Avengers," and art accedes to commerce. Stay until the very end of the credits and you'll even get the prologue to Marvel Film's next chapter. What you won't get is additional time spent with the magnetic Hemsworth, who makes the most of his brief turn in Thor, recalling the twinkling charm of another young unknown who made his mark as a superhero, Christopher Reeve. Let's hope the follow up to Thor really allows the character to come into his own the way Superman II did for Reeve's hero. I think that this movie manages its dual worlds quite well, and found that while the events in earth are less appealing visually, the acting made for it; while in Asgard the thing was a visual delight, but those friends of Thor I found sooo ridiculous (their high point, funny enough, is when they come to earth). Loki is the best damn thing of the movie I'd say. I have somewhat high hopes for this film. I will see it when it releases worldwide in May. Hope it is good, great review! I found the characters on Earth a distraction. I tolerated Portman because she actually looked like she was having fun with the role ("Is this how you normally look?...That's a good look.") But Kat Dennings served no function except that of a sounding board and comic relief. Skarsgard was there only for exposition about the Norse mythology and to set up the future franchise. it all struck me as a little mercenary (but not surprising). Liked your review, by the way. Even though I'm cracking on it, I did ultimately like the film because it exceeded my expectations. I'm not sure it will if you approach it with "high hopes." Though I found fault within the Earth sequences, they played about how I expected them to. My biggest fear was that all things Asgardian (the characters, setting, and actors in those roles, especially Hemsworth) would come off as hokey as they appeared in the trailers. But in this area THOR went far beyond what I had hoped, so overall the film played above average for me. Pretty nice post about this movie thor. I just came across your blog and wanted to say that I’ve really liked reading your posts. Anyway I’ll be subscribing to your blog and I hope you post again soon!